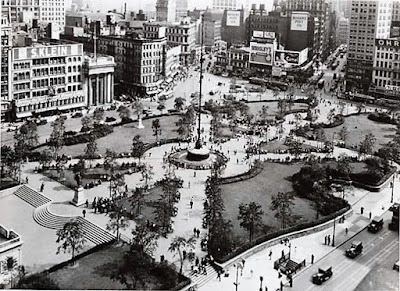 In 1928 Union Square was demolished. Trees were removed, the bronze statues crated and stored, and the entire park bulldozed flat. The project was necessary to create the new underground concourse for the subway. When the park reopened the following year, it was several feet higher than before, requiring visitors to climb stone steps to enter. The statues were relocated, a new Mediterranean style bandstand had appeared at the northern end, and the pathways were redesigned. And a dramatic and controversial new monument was nearly ready for unveiling. Directly across from Union Square, at the corner of Park Avenue South and 17th Street, the new Tammany Hall headquarters was being completed. For more than two decades, from 1902 to 1924, Charles Francis Murphy had headed the organization. Known popularly as "Silent Charlie" or "Boss Murphy," he worked relentlessly to restore Tammany's corruption-stained reputation to one of respectability. On April 25, 1924 Murphy suffered an attack of what The New York Times deemed "acute indigestion" which affected his heart. The symptoms of indigestion were, most likely, the signs of a heart attack. He died at his home and he was given an impressive St. Patrick's Cathedral funeral. Tammany Democrats almost immediately laid plans for a monument to Murphy near its headquarters building. On March 21, 1926 The New York Times reported "A flagstaff probably will be erected in Union Square as a memorial to the late Charles F. Murphy in recognition of his services to the city as a leader of Tammany and as a Dock Commissioner." The newspaper noted "It is proposed to make the flagpole an ornamental affair, with a plaza at its base." Murphy's son-in-law, Surrogate James A. Foley, had suggested the idea of a flagstaff rather than a statue or "showy memorial." The Times reported "It was considered that the erection of a statue might bring about criticism and would not be in keeping with Mr. Murphy's taste." 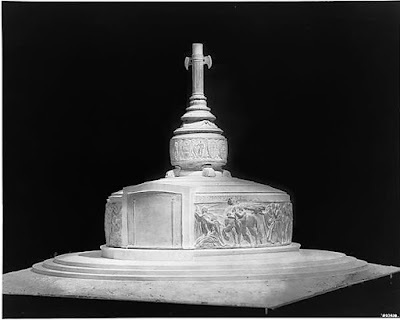 The article also noted "The flagstaff always has been a favorite form of memorial with Tammany, which has erected several at various times, including the one in City Hall Park." By the 4th of July that year the plans had been finalized. Italian born artist Anthony de Francisci had received the commission for the sculptural work. Five years earlier he had designed the new "Peace" silver dollar. Architect Perry Coke Smith would design the granite base and plaza. Tammany announced that three steps would rise from a circular platform. "From the platform will rise a circular sculptured bronze frieze six feet six inches in height. Above this will be a slightly sloped and stepped pediment top to bear the flagstaff. On the south front of the frieze will be placed a decorated brass panel bearing the text of the Declaration of Independence." The entire text of the Declaration of Independence was included in the large plate, executed in bronze rather than brass as originally reported. De Francisci designed the frieze in two parts. Starting from the rear, one procession of figures represented the victims of "the forces of oppression." Moving toward the right, they struggled desperately to reach the Declaration panel. To the left, a procession "of figures suggestive of the blessings of freedom and the enjoyment of happiness" and inalienable rights marched toward the panel. Around the base were to be bronze coats of arms of the original 13 states. As work proceeded on the monument, public opinion began to sour. For one thing, the monumental 120-foot total height of the pole itself became an issue. Patriotic New Yorkers were opposed to a memorial to a Tammany Hall politician that overwhelmed the park's statues of George Washington, Lafayette and Abraham Lincoln. Others complained about such a grand memorial to a Tammany Hall figure in general. Despite Murphy's efforts to clean up Tammany, the taint of corruption still hung on. James A. Foley, in August 1929, tried to quell the grumbling. He insisted that the flagpole "is patriotic rather than personal." And Robert W. de Forest, the head of the Municipal Art Commission, stressed that, according to his understanding, the flagpole would not "subordinate the existing statues in the square." The renovated Union Square opened in 1929. Anthony de Francisci had worked three years on his bronze sculptures. The Charles F. Murphy Memorial Committee chose to dedicate the $80,000 flagpole (around $1.2 million today, all of which was paid for by Tammany donations) on July 4, 1930. The date would be especially appropriate; the 154th anniversary of the signing of the Declaration of Independence. The project "which aroused protests when it was announced as a memorial to Charles F. Murphy" as described in The Times on May 22, 1930, had taken a different route by now. The newspaper's article carried the partial headline "To Commemorate Independence, Not Murphy." Newspapers as far away as the tiny town of Canadian, Texas picked up on the story. The town's Canadian Record reported "On a second thought, the memorial committee decided that Mr. Murphy, although a powerful Tammany leader, was not greater than the three others in Union square, so the flagpole is to commemorate American Independence." The article ended "Mr. Murphy, who had a sense of humor, would approve of that change." Victims of tyranny struggle towards Liberty on one side of the monument (above); while those enjoying freedom approach the Declaration on the opposite side. The soaring flagpole, one of the tallest in the state, with its monumental base became the center of the new Union Square. Carved into the granite above the sculptures was a quotation from Thomas Jefferson. "How little do my countrymen know what precious blessings they are in possession of and which no other people on earth enjoy." Tammany Hall was able to manage one unnoticeable nod to Charles F. Murphy. High above Union Square, at the very tip of the pole was a gilded bronze finial "in a design showing a liberty cap," according to the Central Mercantile Association's president, C. Stanley Mitchell, just prior to the dedication. The liberty cap was the symbol of Tammany Hall. The dedication of the Independence Flagpole took place in unhappy times. The Great Depression had put thousands of New Yorkers out of work. 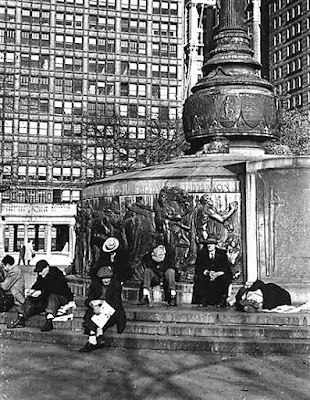 The steps of the monument immediately became a spot for down-and-out men to sit or sleep. The Government's Works Progress Administration, which provided employment to artists, construction workers, and writers, initiated a restoration of the flagpole around 1934--despite the fact that it was essentially brand new. For several years the Society of Tammany held Independence Day ceremonies at the flagpole. On July 4, 1936, for example, exercises began at 9 a.m. with the raising of the flag and the singing of the "Star Spangled Banner." That morning naturalized citizens were invited to attend and Tammany was apparently determined not to leave any group out. The Times reported "In addition to the sachems and members of Tammany, there will be present several hundred members of the Naturalized American Citizens Association with children of Armenian, Carpatho-Russian, Chinese, Croatian, Czech, Finnish, French, German, Greek, Hungarian, Irish, Italian, Lithuanian, Polish, Puerto Rican, Russian, Serbian, Slovak, Slovenian, Spanish, Swedish and Ukrainian origin." Also included was one Native American. Chief White Eagle, a full-blooded Cherokee and World War I veteran, was present. On November 10, 1938 syndicated journalist Charles B. Driscoll's "New York Day by Day" column described the unemployed population who gathered daily at the base of the Independence flagpole. One group of men, he said, were engaged in a heated political debate. "I got close enough to hear the two principals tossing billingsgate at one another, but I could not understand a word either one was saying. The dialects were so much at variance that I don't think either of the contestants knew what the other was talking about. The crowd was out for blood." But Driscoll was more interested in another man. "Amid all the excitement I observed an elderly man in clean, well-mended clothes, sitting on one of the steps, darning his socks." Driscoll estimated his age about "past 60" and said he wore a windbreaker and winter cap with pull-down flaps over the ears. "The socks he was darning were bright blue and white. They were as clean as any you ever saw, and he had another clean pair on his feet...Maybe he was homeless, but if so, how did he stay so neat and clean? In any case, his quiet industry and ability to mind his own business obviously commanded respect. There were no wisecracks from the neighboring derelicts, out for their sunning." By the 1970s Union Square was the haunt of addicts and drug dealers. Its once-manicured lawns were weedy and overgrown and trash littered the walkways and shrubbery. The flagpole had been removed from its base and by the early 1980s most New Yorkers had forgotten the purpose of the stump-like granite and bronze drum that remained. The first phase of an $8 million renovation of the park was completed in the spring of 1986. But it did not include the Independence Flagpole, which, according to Martha Lagace of New York Magazine on April 14, "is ringed with moss-covered reliefs." Lagace was indignant that the reopening did not include a flagpole. "What seems like a strange, stubby sculpture in the center of Union Square Park is, in fact, an ornate bronze base that once held a flagpole," she reminded readers. "When the southern end of the park was reopened, last May," she wondered, "why wasn't a flagpole an opening-day priority, as it has been in other parks?" Manhattan Borough Commissioner of the Parks Department, Pat Pomposello, offered an indifferent reply. "At least there are no junkies here anymore. So we can certainly live without a flagpole." Although the inscription gives the dedication date as July 4, 1926, the 150th anniversary of the Declaration's signing, the monument was still in the earliest stages of development at that time. Finally, in 1987 the Independence Flagpole was restored at a cost of $100,000. The restoration came at another price, as well. The liberty cap finial--the only evidence of Tammany involvement in the monument--was replaced with a gilded sunburst.